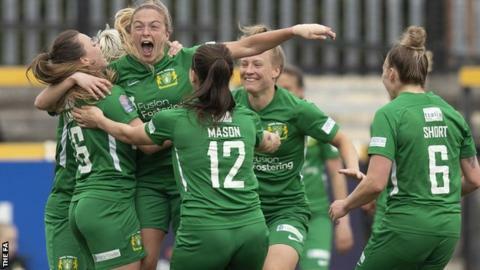 Yeovil Town Ladies hope they can start a "new chapter" in the Women's Championship next season, after they avoided going into administration. The Women's Super League outfit will bid for a second-tier licence for 2019-20 and revert to part-time status. They were given a 10-point deduction by the Football Association - who run the WSL - on 28 March. Yeovil will be sure to finish 11th if they do not beat Reading on Wednesday, but they intend to rebuild in tier two. The points penalty came as a result of the club informing the FA of their initial intention to appoint an administrator. Cuts to off-field staff and subsequent financial support from the FA, however, meant insolvency was avoided. Administrators were never formally appointed, but Yeovil will not appeal against the 10-point sanction and say they are hopeful of competing in next season's Women's Championship. "The FA worked with us and we did not go in to any formal insolvency or administration because they advanced us some of next season's money," owner and former chairman Stephen Allinson told BBC Sport. "But because of our agreement with them, because of our difficulties, unfortunately we had to accept the trigger of the sporting sanctions. "It's been very difficult but we believe there is light at the end of the tunnel. We have acted properly and honourably. It's been a rollercoaster but we will hopefully come back stronger." Yeovil will host Reading in the Women's Super League on Wednesday [19:45 BST], when any result other than a victory will guarantee they will finish this campaign bottom of the table. What went wrong for Yeovil Ladies? The 2016 second-tier champions upgraded to full-time status last season after being one of 11 clubs to receive a WSL licence from the FA, but they have been running at a significant loss this term. BBC Sport understands the club were expecting about £100,000 from a commercial income stream that did not materialise. "We realised in February that a particular income stream we had planned for would not be forthcoming," Allinson said. "It was there, in good faith, and it didn't come through. "We always knew that we weren't going to be on a level playing field because of the money other clubs are given by their men's clubs. "I'm pleased that they are supported by their men's club, but we weren't. All our board are volunteers, professional people who volunteer, giving up hours of their time, free of charge, to run this club." Allinson stepped down from the board last year for personal reasons but remains the majority shareholder, and thanked board members Gary Dawkins, Alison and Kevin Smith and Becky and Andy Bevins for their support. He continued: "There have been sleepless nights because we feel we have duties to honour, and I want to thank all of the board and former West Ham United Women chairman Stephen Hunt for his personal help." Yeovil are the only current WSL side that is not supported by either a men's Premier League or a men's Championship affiliate. Linked by name only, Yeovil's men's team - who are 23rd in League Two - do not provide support for Yeovil Ladies under the existing ownership. But Allinson is hopeful of a "new chapter" and a positive relationship with potential new owners of the male side. "I've always been very sad that the current owners of Yeovil Town FC haven't felt able to embrace women's football," Allinson added. "We've added very much to that brand. "Initial discussions with some of the people who hopefully are going to take over have been very warm and positive. "But it's not only about the money. You can embrace your women's club in a number of ways, in terms of joint marketing activities, ground-sharing, giving free training facilities. "All those things would be really important to us and would be fantastic if the new owners could see that, to benefit the football club and the community overall." With the FA having provided Yeovil with some of 2019-20's divisional grant money in advance to pay the remainder of this season's wage bill, will that leave Yeovil short of cash again next term? "We have put a plan together," Allinson said. "We have recognised that we've had this money early but we believe the plan is sustainable and we will make sure it is. "We will not get ourselves in to the situation that happened this year. But if a sponsor wanted to talk to us about opportunities, that'd be great. "The women's game needs clubs like Yeovil because they are the bedrock of it. We've always punched above our weight in terms of support. We owe it to our fans, to move forward. "We've probably overachieved in the past few years and it would be tragic to lose that, with the crowds we get." Yeovil have attracted the fifth-highest average home crowds in the WSL this term - despite playing in Dorchester - behind Chelsea, Manchester City, Arsenal and West Ham. But they are not the first women's side in recent years to drop out of the top flight because of financial problems. In 2017, Notts County Ladies folded on the eve of the Spring Series, just two days before their first scheduled match of that campaign, leaving many of their "gobsmacked" players "jobless and homeless". Then last summer, Sunderland dropped down two divisions, from the WSL to the Women's National League North, after they were unsuccessful in their bid for a licence to play in one of the top two tiers. Meanwhile, Sheffield FC and last season's second-tier winners Doncaster Rovers Belles both withdrew from the Championship last summer for financial reasons.